It’s Monday morning. The alarm is set for 6 a.m., but Sheyla Martinez-Bautista is already revving up the engines in her Springfield home. She helps get her little brother ready for school, kisses her mom goodbye and then heads over to the UO for eight straight hours of freshmen classes and her work-study job. At 5:30 p.m. she dashes home. Her mom works two jobs, so some nights it’s Martinez-Bautista’s job to cook, clean and help her two younger siblings with homework. Then it’s time for her own studies. She listens to the “Pirates of the Caribbean” soundtrack — movie scores help her relax — and calls it a night. Her clock says 1 a.m.
It’s a schedule Martinez-Bautista repeats every other day as she tackles her first year of college. Demanding? Sure. Would she trade it? No way. She’s here — and embracing the challenges of college with confidence — in large part due to four summer camps in the UO’s Summer Academy to Inspire Learning — SAIL. SAIL is designed to give Oregonians in the National School Lunch Program the opportunity to transform their lives by attending free summer classes on the UO campus and become excited by the possibilities of college life. 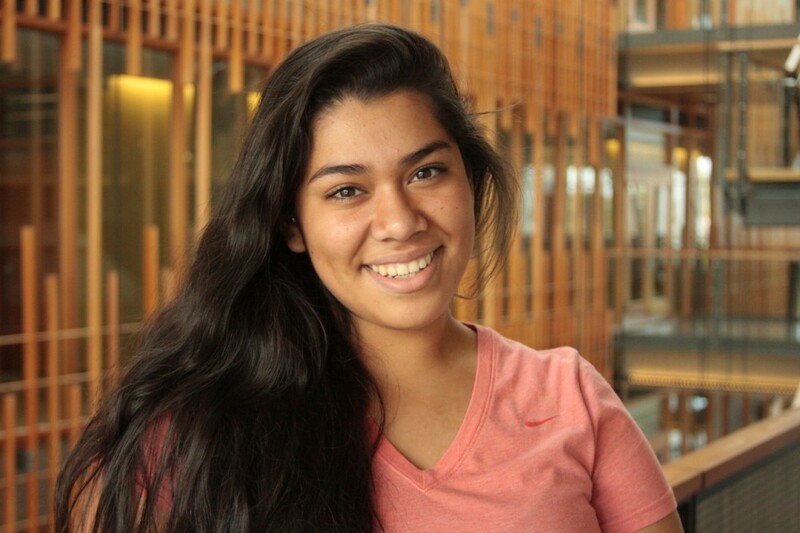 At SAIL, Martinez-Bautista sampled subjects ranging from physics to economics, got help with her college application and had an eye-opening experience when Nike employees came to a business class. Inspired, Martinez-Bautista now has her sights set on her dream goal — working for the National Football League. SAIL - Making college a reality for first-generation college students from SOJC on Vimeo. The SAIL experience that helped Martinez-Bautista now has the possibility to reach even more students through the UO’s new crowdfunding platform, DuckFunder. The SAIL crowdfunding campaign kicked off Oct. 20 with a goal of $15,000. Thanks to a generous gift from an anonymous donor, every contribution will be matched dollar for dollar, up to and beyond the crowdfund goal. It’s an important project for SAIL, which survives entirely on donations and grant funding. SAIL began in 2005, when UO economics professors Bruce Blonigen and Bill Harbaugh visited an eighth-grade classroom armed with decks of playing cards, rolls of quarters and playful ideas to instill in those students the joy of learning. Today, SAIL is a full-fledged program that hosts more than 200 students each summer in two one-week sessions. Classes cover such topics as budgets, social psychology, cognitive neuroscience, Native American culture, the physics behind rock climbing and the chemistry of ice cream. Over the course of each camp, students not only learn about the world but also that life at one of the top universities in the country is within their reach. The Oregon Education Investment Board lauded SAIL as one of the state’s top three innovative programs — the only one for high school students that was recognized. What’s more, SAIL’s work has been accomplished on a shoestring. Every penny raised goes back into the program for scholarships, work study jobs, internships and program costs. And all of the 100-plus participating UO faculty members contribute their time. SAIL - Engaging students through hands-on science labs from SOJC on Vimeo. But as successful as SAIL has become, demand continues to rise. “Each year, we attract twice as many applicants as we can enroll,” Fernandez said. And that’s where crowdfunding comes in. Every $100 raised can put a student through a week of camp. Donations will also help with expenses after students get to college and support summer staff positions for students. The ultimate goal: expansion of the program to include residency in dorms, more camps and more scholarships. All of this benefits an approach that aims to help first-generation, low-income students believe that success in college, and a better life for their families, can be achieved. Outgoing and expressive, Martinez-Bautista had plenty of fun during her time in SAIL, and especially last summer, when she worked as a SAIL counselor. But she also worked hard. Her exceptional high school GPA, combined with her family’s limited income, qualified her for financial and academic assistance through the UO’s PathwayOregon program. Still, it was her SAIL experience that had a profound impact. Her parents had only grade-school educations. Martinez-Bautista credits SAIL with helping her achieve her proudest accomplishments to date: graduating high school and being the first in her family to attend college.